Well, the snow that has been creeping down Britain for the last week has finally reached the roof and it's a sorry sight. We had some hard frosts last week that didn't do any visible harm but an inch of snow and everything flops like a leaf that's had its cell walls destroyed by expanding ice. Not to be put off, I've had Iris orientalis and more sibirica hybrids soaking for 36 hours so I really had to plant them, which is what I did. 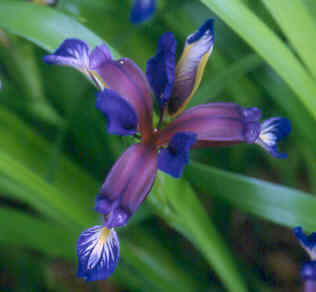 Iris orientalis (syn. ochroleuca). A tall (1m upwards) member of the Spuria group and an excellent garden plant. 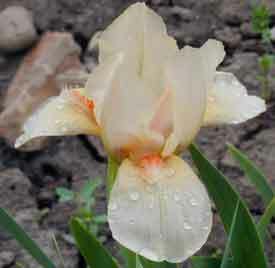 The flowers often have whiter falls than this example but as with anything in nature you'll get variation. My rules for success with Iris seed are incredibly simple and have yet to let me down: soak for 24 hours and sow thinly (they're quite big so easy to manipulate with the end of a label or something), cover with compost or vermiculite. And do all this in winter so they get at least two months of stratification. And come spring you should see little green swords scything through the surface layer. This has worked for Sibiricas, Spurias, Beardeds, Pacific coast and other beardless types such as maackii, graminaea, bulleyana, innominata, sintenissii, pseudacorus, etc, etc. Everything else falls into the beardless, although there are many divisions within this, from the bulbous reticulata bulbs you see in Jan/Feb to the stoloniferous yellow flag of our native rivers, Iris pseudacorus. At the moment I have seedlings of sibirica hybrids (crosses made by someone else, not me, I'll get to that in a year or two!) , douglasiana hybrids, ditto, and ungerminated pots of I. attica, orientalis and Pacific Coast hybrids. 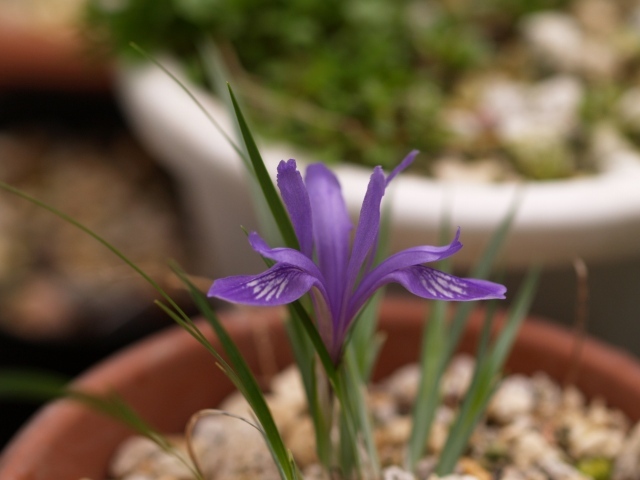 Iris attica, at home in the mountains of Greece, is one of the smallest, if not the smallest, of the beardeds, and is also very variable in flower colour, asyou can see here. They get much bluer too! As there's nothing doing outside (it's all covered in snow!) I thought I'd take you through what I can expect Iris-wise next year. First will come the reticulatas, indeed I have a pot of straight reticulata which has 8in leaf spikes but no sign of any flowers. But then it's only November. 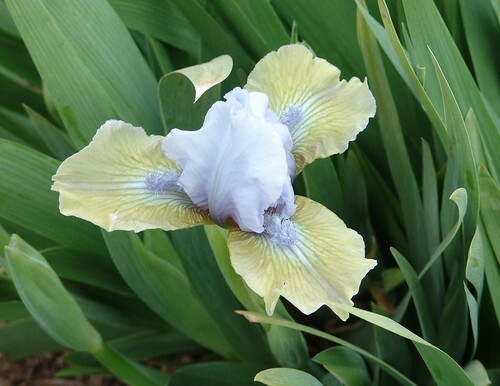 I also have a white for called "Natascha"
While we're on the little bulbous ones, we might as well cover Iris danfordiae. This is an odd one, famous for flowering and then seemingly disappearing. One theory is that the mature bulb breaks up into lots of little bubils after flowering, as small as grains of rice, and just get lost. By growing in a small pot I'm going to find out exactly what happens by emptying the contents after the leaves have died back and going through them forensically! 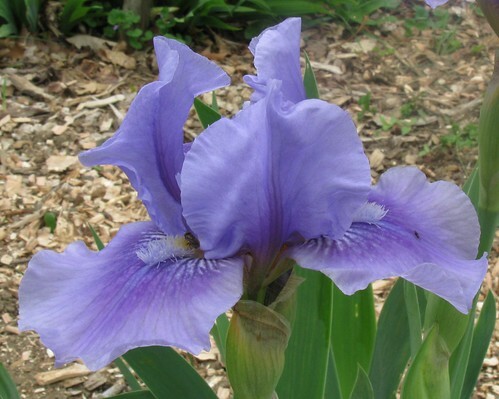 Also in this group is an Iris I've wanted for ages. I remember the buzz when it first came into being in the late 80s and watched the price come down from £20 a bulb to about £2 thoughout the 90s as the cross was built up. It's now sufficiently numerous that I was able to but 10 for £2.99. So I bought 20. 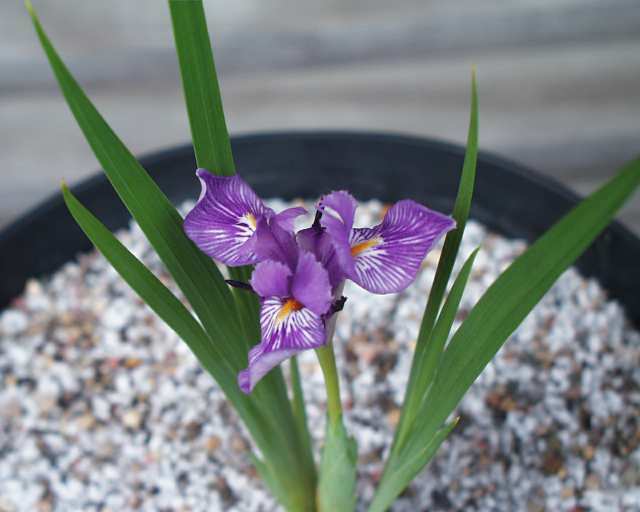 Say the Pacific Bulb Society in the US: "A justifiably coveted reticulata Iris hybrid of Iris winogradowii and Iris histrioides. When it first opens, the flowers have an ethereal color scheme that's hard to describe; a tinge of sea-green suffused with powder blue and fabulous intricate markings. From here it's into the bulb frame for the junos, named after a Roman God, In fact the first who species don't really need a bulb frame if you have a patch of well-drained soil that captures the sun. 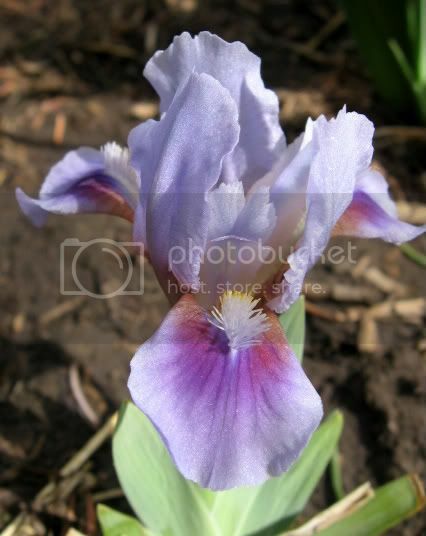 Iris bucharica is naturally found in country's such as Takjikistan and central Asia where the weather is considerablt different to London's. The flower early and then go to sleep (in dryness) until next winter. Get the watering wrong with junos and they will rot on you. And they ain't cheap. My most expensive cost me £17.95. I.bucharica. And, yes, the foliage does look just like maize. Fortunately the flowers are more interesting. The flowers, themselves atypical in the width of their falls are held high above the leaves of I. cycloglossa. Next up are a couple that look similar but the first is new to cultivation, which is why it cost £20. 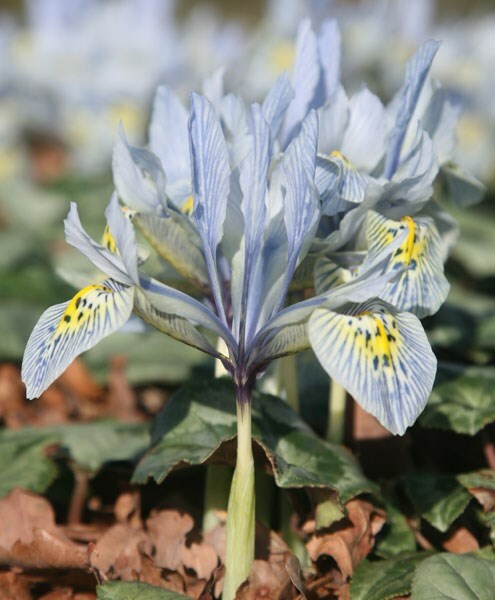 In fact it's so novel I can't find a picture of it but Paul Christian, my dealer for Iris fixes says of it: "A wonderful new juno recently introduced from Continental Europe but originally native to Central Asia. This has compact, stocky growths composed of short but broad, glossy green leaves clustered around the central tube which supports a large golden yellow flower borne very early in the year. In effect this is like a golden yellow Iris nicolai. Sharply-drained, loam-based compost with good air circulation around the plant. This is probably best under glass until its needs are appraised, but early indications are that it is probably growable outside in the UK once you have spares to risk!" (I don't). Hopefully I can show you my own photos in a few months because it already has the first signs of growth so the odd drenching, followed by a wait until it is almost dry, followed by another flooding etc. A rather poor quality picture of I. orhioides, which completes my juno collection. So, on to the next scarily difficult type, the regalias. There is a really quite easy species in this group call hoogiana which I grew under cover in Scotland all those years ago and it a photo can't do it justice. An amazingly powerful scent from a beatiful baby blue bearded flower. I'm not growing it just now, I think because it looks too similar to the regular bearded hybrids, the finite space and the fact I wanted to try a different species. I. stolonifera. As the name suggests it spreads by stolons (not easy in a pot) and also not easy to work out which bit goes upright so I just laid the three 4-5in strips on the surface of the compost (plenty of perlite, sand and grit and slow release food granules) and decided to let gravity do the work. A light covering of compost and then grit. No water until the first sign of growth until signs of growth or January, whichever comes first. Told ya it was eye-catching! I'm also growing I. imbricata, a difficult but not bulb-frame difficult (I hope! 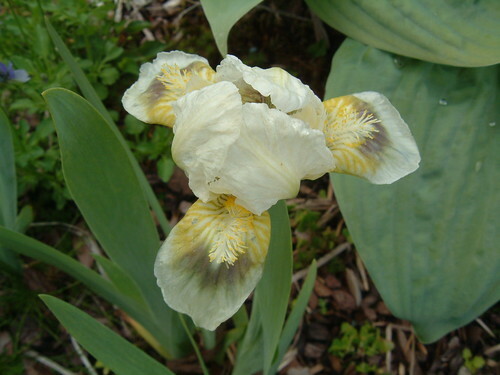 ), a bearded cream to yellow beauty of intermediate height which is a tricky one but given the right, free-draining conditions it's heck of a lot easier than the above. It doesn't really need a bulb frame or alpine house but it does help keep the showy blooms neat and tidy for longer. 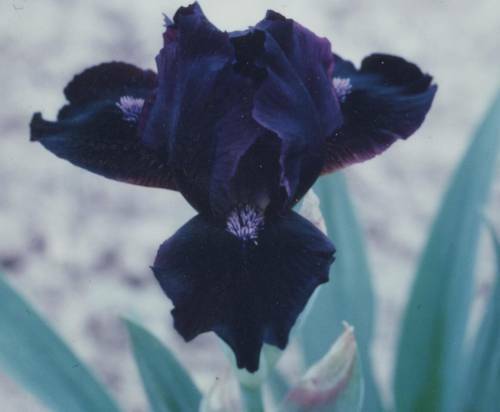 The image right at the top of the post, "Aquilifer" is an arilbred iris (the aril is a little white bit on the seed, we don't need to worry about that). 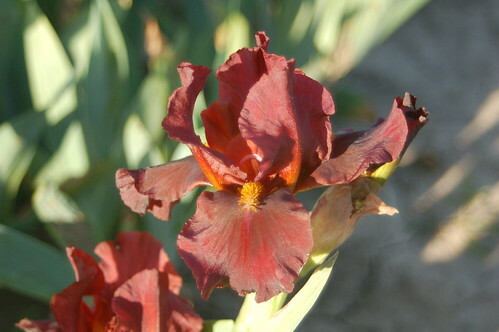 These are often stunning crosses between members of the Regalias or Oncocyclus and common bearded irises. 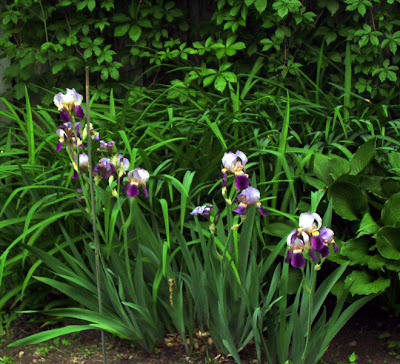 Arils are generally not easy to grow in temperate climates, tending to be susceptible to rust and rhizome soft rot. Without a regular spray program, it is easy to lose them. I dust the rhizomes/stolons with sulphur, which has the benefit of being bright green so you know if you've missed a bit. It is particularly important to dust if you have had to cut the rhizome for some reason. 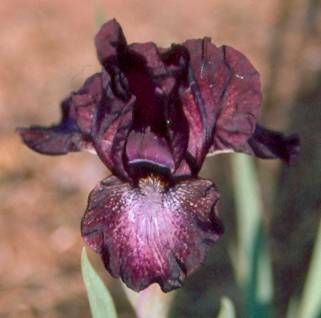 The Regalias and Oncocyclus have fine, insignificant leaves, in contrast to the lush green leaves of the standard bearded irises. But the flowers are spectacular, with interesting coloured patterns and shapes. The colours of the Arils can be very pure and clear, or the flowers can have amazing contrasting blotches on them. 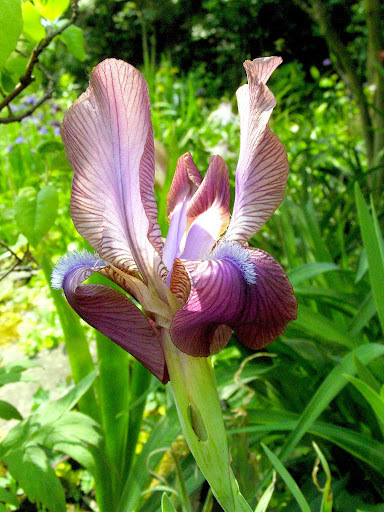 When crossed with bearded irises, some of these characteristics are retained and, in others, fascinating colours, streaks and patterns may emerge. I have four, the above Aquilifer, Heimdahl, Jehosaphat's Reliance and a numbered but un-named cross the supplier gave me as a freebie. Images are impossible to find anywhere on the Web so we'll just have to hope mine make it to bloom so we can enjoy them together! Now I'll wrap up the other beardless specimens I actually have, as opposed to ungerminated seed, that being a white pseudacorus and the previously mentioned hybrid collections. 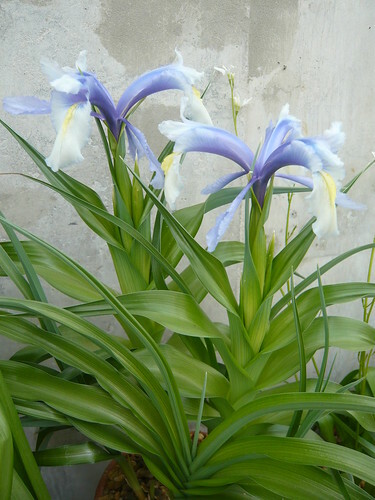 From Eastern Europe and Asia, it has fragrant violet flowers. Obviously "nana" means the miniature form and has nothing to do with its grandmother! Next up is the rather similar I. colettii, the only difference being that this one's lovely flowers only last a single day. It came from one of my usual suppliers and I wouldn't expect them to get the order wrong or use an out-of-date name for versicolor, so I'm going to assume it is kerneriana, which has odd, thin yellow fowers. An oddity and not necessarily beautiful but a lot more fun than I. versicolor! 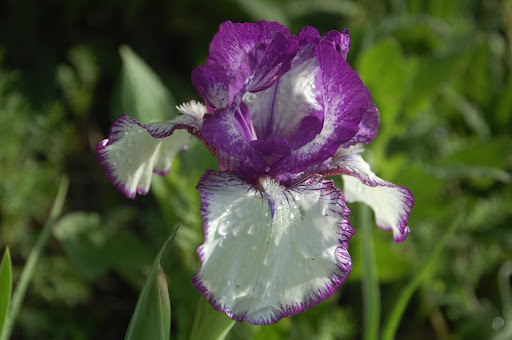 And this one caused a stir last time I showed it, the humble Iris graminaea, or Plum Iris, not sure if that's because it smells like plums or has a plummy colouring. And I don't really care. I'm not, and never would grow this because I find the whole Xiphium Sub-genus dull. I did raise it from seed in childhood, not sure why or where I got the seed from. Hmmm, they should still be there actually... must have alook next time I go to see dad. Anyway, I've got a couple, one that's part of an inspired planting scheme in a big terracotta bowl and the other I think was a free gift (spend more than £500 in our garden centre and get these, sort of thing). And "Eye of the Tiger"
And that completes the beardless, I think, although you will, of course, have spotted that both I. stolonifera and "Dardanus"have beards. But they just fitted better in there because now I'm going to go through the beardeds and it will be like a Monet painting. 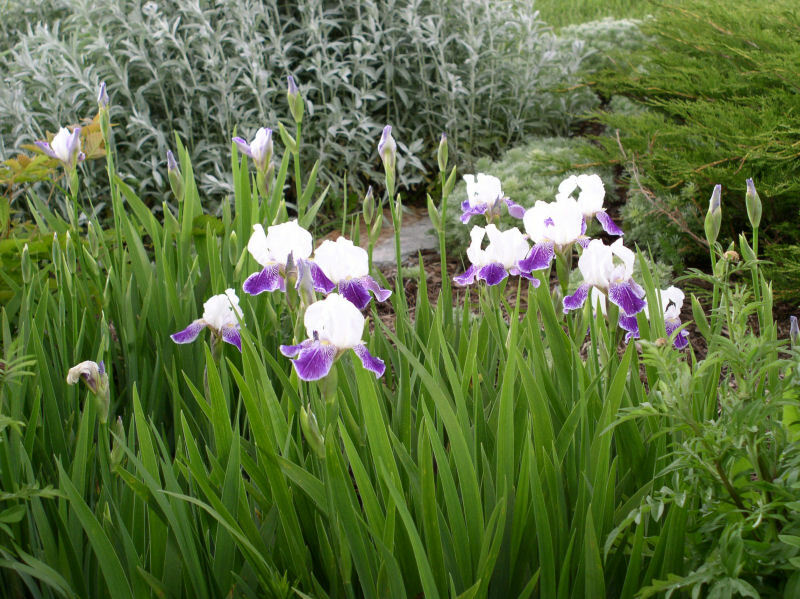 These are ones everyone thinks of when you say Iris and are very easy to grow. They like a sunny spot and their rhizomes just on the surface of the well-drained soil where the can have the summer baking that will give you a great show next year. Lift and divide every fourish years as they tend to die out in the middle and you want to keep the vigourous new growth. Do this after flowering (obviously) but not immediately. First feed the plant well as this is when it's building next year's show in the outer rhizomes and let the sunshine do its work. Then, when the soil is still warm so the plants have time to establish, get the spade out and lift the whole lot, either chopping of a chunk with a few rhizomes for a possible instant replay next year or using a knife to cut off individual rhizomes. Whether replanting in the same spot or elsewhere make sure you prepare the soil well with good compost and and a handful of food. Give the leaves a trim to stop them rocking in the autumn wind and you may not get a flower next year but you will get a great show the next year. I have 16, 14 imported from Cayeux nurseries in Spain or possibly France. The two others I got on ebay for a quid it two.